Baby oil has many uses from softening skin to oiling a squeaky door, but did you know it can be used to shine and polish your household chrome fixtures and faucets? 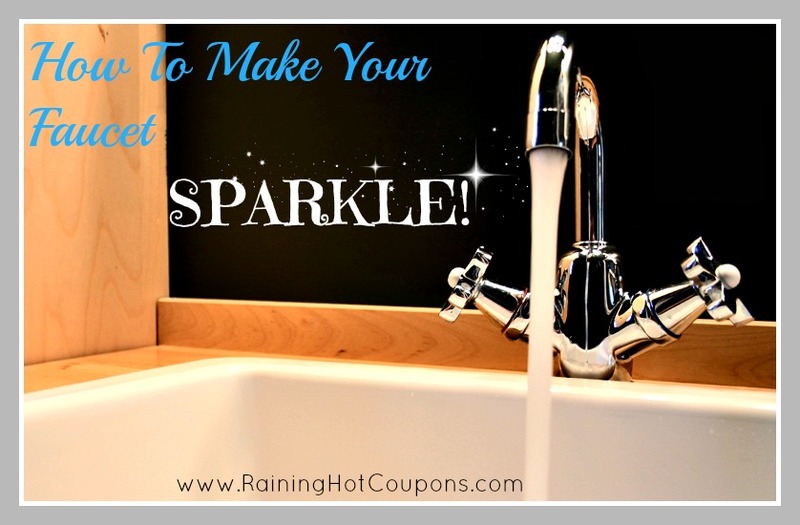 All you need is a few cotton balls or a cotton cloth and a dab of baby oil to really make your fixtures sparkle. Give all sides of the fixture a good wipe down until they look brand new! You may not have known this but there are actually a TON of different things you can do with Vinegar from cooking and cleaning to first aid and gardening! Since vinegar is so inexpensive, this is a great way to save money! Perk up canned sauce or soup – add a little vinegar! Shiny Coat – Spray dog, cat, horse with 1 cup white distilled vinegar to 1 quart water. Spray an area to keep the animal from spraying, or doing their bathroom business in a spot (always test spot first). Water lines or Calcium build up on water bowls – wipe them down or let them soak in white distilled vinegar (some need to set overnight) and then rinse well. Spray the leaves of plants with vinegar to prevent cats from chewing on them. Cleaning solution – add 1/4 cup baking soda with 1 tablespoon liquid detergent. Then slowly add white distilled vinegar to make a thick creamy texture. Remove dors from dishwasher – use 2 cups white distilled vinegar inside an empty dishwasher and run cycle. Lunch box odors – put a slice of bread that has been soaked in white distilled vinegar and leave overnight then remove and rinse the lunch box. Easily remove a label, price tag, sticker, etc – use a cloth soaked in white distilled vinegar, leave on until sticker slides right off. Clean microwave – remove splattered food and deodorize, boil a mixture of 1/4 cup vinegar and and one cup water inside the microwave for 1-2 minutes then clean out. Toilet cleaner – Pour 1 cup of white vinegar in the toilet bowl, let it stand for 5 minutes and then flush it. Take stains out of clothes – Remove perspiration stains from clothes by applying one part vinegar and four parts water on the spot, rub and then rinse. Brighten fabrics – when clothes is in the rinse cycle add half a cup of vinegar. Remove grease from suede – dip a toothbrush in vinegar and gently brush over the grease. Fabric softener – 1 part vinegar and 2 parts water in your fabric softener dispenser. Prevent clothes from clinging – add 1/2 cup white distilled vinegar to the wash cycle. Forget about clothes?! – Pour 3 cups of white distilled vinegar in the machine and wash the clothes in hot water after that run a normal cycle with laundry detergent. Will get moldy smell out. Get rid of musky smells from cotton clothes – sprinkle with white distilled vinegar and then press them. Remove soap residue on clothes by using white distilled vinegar in the final rinse. Remove stains on clothing aby soaking in equal parts milk and white distilled vinegar. Patent leather shoes and bags more shine – wipe down with a little vinegar. Sometimes shaving cream can seem like an un-needed added expense (unless you of course get it for FREE with coupons) but if not, then you may love this next tip! You can use conditioner (yes, hair conditioner) instead of shaving cream and shave your legs with it. Feel free to use any kind (including the cheap stuff!). This is a perfect way to use conditioner that you may get for free or cheap with coupons. It’s not very frugal when you have to throw lettuce away because it got soggy, moldy, smelly and just nasty. So use this tip to help make your lettuce last longer! Here’s a neat and cool way to make a dry erase calendar! Just follow the instructions below to make your very own dry erase calendar using paint chips, a little bit of glue, and a picture frame!! Have you ever made a dry erase calendar? Sometimes we forget to do the simple things to save money….like turning lights off, so below are some easy reminder of ways to lower your utilities! Lowering your electric bill isn’t just about saving money, it’s also about saving energy. Use these tips to help you easily do both. 1. Turn off lights when you’re not using them. Yes, this is a simple one, but it’s something many of us forget about from time to time. It’s the little things that add up. 2. Don’t window shop the fridge. Refrigerators are one of the biggest energy users in our homes, so you want to make sure it’s operating efficiently. The quicker you get in and out, the colder your refrigerator will stay without having to use extra energy. Remember to vacuum the refrigerator coils and defrost if necessary. Also, keeping the fridge and freezer stocked will help conserve a bit of energy as well. 3. What’s your water heater set on? Turn down your water heater to 120 degrees. You won’t need it any hotter than that for a shower (ouch! ), and it’s a big energy-drain if it’s much higher than that. It’s best to use natural light when at all possible, so open the curtains and raise the blinds! Replacing your incandescent light bulbs with the higher efficient fluorescent bulbs can also help because they use less than half the amount of energy! These bulbs do cost quite a bit more to purchase, but they last longer which will save you money in the long run. Keeping your air filters clean is a great way to save some money. Dust and dirt can hinder air flow, so keeping them clean will help. 6. Use a fan, or open a window. If the weather is nice, open the windows and let the breeze flow through the house. Using a fan will also help the room you’re in feel cooler, but leaving it on while you are gone is pointless. It’s not like the air conditioning unit, and it won’t keep it much cooler while you’re not in the room. Fans basically cool us off, not the room. 7. Wash cold, and air dry. Wash your laundry in cold water if at all possible, and then hang it outside on the line to dry. Keep in mind this requires good weather, and if you or your kids have allergies it may not be a possibility because allergens can get onto your clothes. 8. Get rid of the less known energy-suckers. A few things are sucking energy from your home and you may not even realize it: TVs, VCRs, computers, and even microwaves. If you plug these items into power strips instead of the wall, you can turn the entire strip off between uses instead of having to unplug everything each time. Some houses, especially older ones, tend to let cool air escape in the summer (and let cold air in, in the winter). Weather stripping can not only save you lots of cash, it can also conserve major energy. 10. Use a Crock Pot. It may seem like a crock pot would use a lot of energy, since it’s on all day, but it’s usually cooking at a low temperature so it’s not going to heat your entire kitchen up like your stove and oven do. How do you save money on utilities? I know a lot of you are looking for ideas on how to lose weight for a New Years Resolution…I have a simple yet effective way to help you out! One of my friends told she has been doing this and has watched the inches melt away. I myself have tried and actually feel much better and have more energy! The tip is Lemon Oil! Yes…you know, that stuff that smells REALLY good?! You can get it here on Amazon or at your local health food store. Add 2-3 drops to a bottle of water and sip it throughout the day. When it’s gone, refill your water bottle and add more lemon. This will help you to get your daily water needed as well as give you the MANY benefits of lemon oil which includes speeding up your metabolism. Every night before bed, run some lemon oil into your problem areas (tummy, thighs 😉 ) and it is suppose to melt it away. Seriously, I know a few people who swear by this!